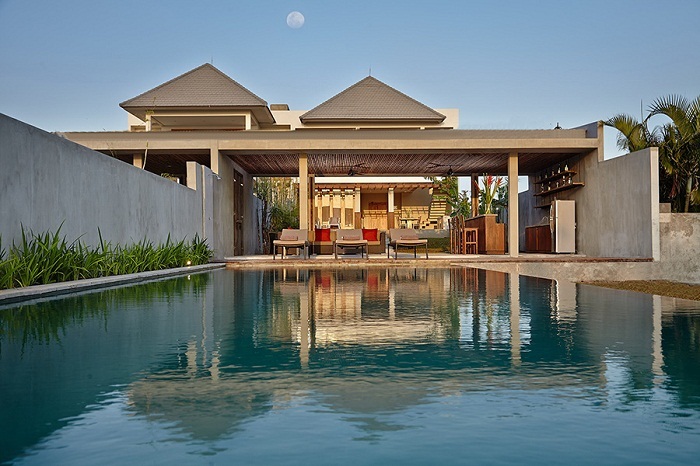 Villa Bali Mengening consits of two villas, Bali Mengening 1 and Bali Mengening 2. 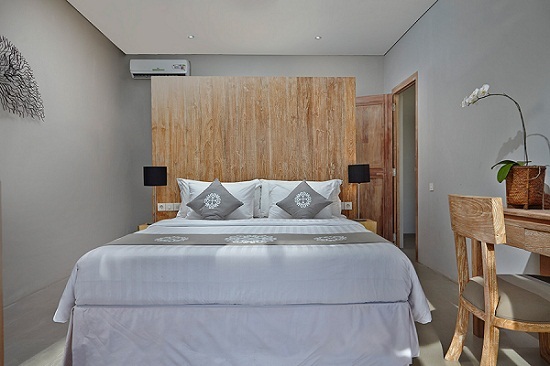 Both 3 bedrooms villas are not identical in design yet each room is having with fantastic views of the Indian Ocean, it has antique connecting wood doors that can open up to form a 6 bedroom villa. Designed as tropical architecture with exclusive interior design and most of furniture are from solid Indonesian wood (teakwood and ironwood) with natural and traditional touching. The whole second level of this mengening villa is dedicated to the spacious 80 m2 master bedroom . It consist of ample balcony , foyer and great bathroom. The king size bed with net, air conditioner and 32 inch tv plasma . Luxurious large bathroom equipped with special outdoor jacuzy allowing you to enjoy the pleasure of viewing the ocean while bathing. The rooftop is the spectacular place to enjoy the beautiful terrace rice field. The interesting point of hindu shrine pura gede batu ngaus built on the big rock of the other side of the sea is an unforgettable view to see. There are 2 bedrooms in the first floor of this villa, sizes 4m x 5m, installed with airconditioner, ceiling fan, 32 inch plasma tv. Reclaimed solid teakwood used overally to the bed and large wardrobe. Both of these bedrooms surely have their own ensuite indoor/outdoor bathroom with abundant fresh natural sunlight coming inside. The open air shower and big standing bathtub ensure the luxury style of the bathroom. The dining area of 30 m2 size caters 6 seaters in a table island style formation , open air to the private green garden. Professional kitchen with the cook at the backservice area will support the dining. The living area and bar is the open air area , the huge spot that gives you the best experience of feeling the ocean, enjoying friends and family gathering . This space covers 85 m2 area which also extends directly to the open air wood decking flooring that serves as sunbathing spot before swim. A private infinity style swimming pool of 5m x 14 m, 1,5 m depth completes each villa facility to make sure your best staying at villa bali mengening. We have three bedrooms of the similar size 4m x 5m . The master bedroom is in the firstfloor with all its ammenities such as air conditioner, ceiling fan, 32 inch plasma tv equipped. Reclaimed teak wood have been used for the beds headboard, large wardrobe. It has its own terrace space and an ensuite bedroom/outdoor bathroom with an open air rain shower and large freestanding bathtub. Next to the Master Bedroom is located a plentiful space of Dining area (sits of 6 or more) and equipped with kitchen set, meals are prepared at the back house where there is a complete professional kitchen. 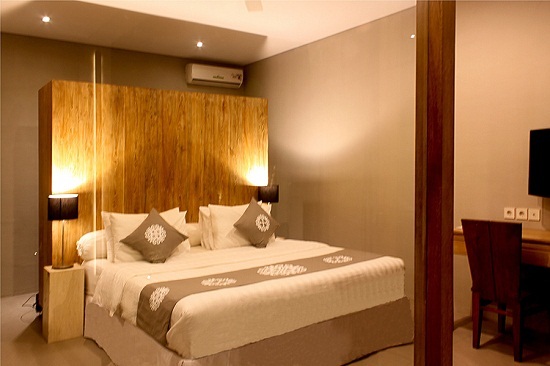 Two other bedrooms are located at the second floor, they are equipped with air-conditioners and ceiling fans, 32 inch TV Plasma. Reclaimed teak woods have been used to create backboards for the bed, which also form the large wardrobe. They have nice wider balcony. Each has almost identical an ensuite indoor bathroom with an open air circulation shower. A private infinity swimming pool of 5m x 14m meters with 1.5 meter depth, overlooking the beach and rice terrace field. In between swimming pool area and the beach, we have a spacious gardening where we can arrange a romantic sunset dining experience, a party with friend or gathering family barbecue . Its capacity is up to 50-60 people.